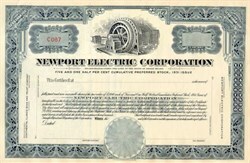 Beautifully engraved unissued Certificate from the famous Newport Electric Company dated 1931. This historic document was printed by the Columbian Banknote Company and has an ornate border around it with a vignette of an old power generator next to a city. This item is over 69 years old. Newport Electric serves more than 32,000 customers in south coastal Rhode Island. It is a subsidiary of Eastern Utilities Associates, a Boston-based diversified energy services company.